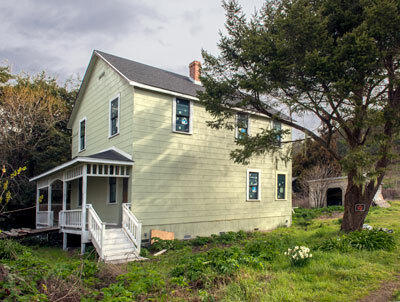 "This building is the last reminder of Point Arena's small red-light district. 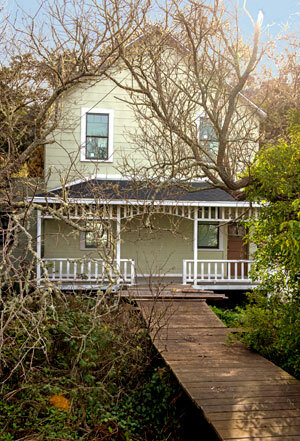 It was built about the turn of the century as an addition on the front of a house that had previously been the residence of the owner of an adjacent brewery. The enlarged structure then opened as the Italian Hotel, presumably to cater to the trade of the many workmen from Italy who labored at the mills and ranches in the area. But the building got the reputation for being a brothel, which it kept until it was "cleaned up" soon after the town's incorporation in 1908. The original rear part of the building was torn down sometime in the next fifteen years, and the remaining part became a residence. The Scaramellas were early occupants. Just north of the building was the Chinese settlement of houses and businesses, where a few small buildings served the social, medicinal, and sexual needs of Chinese workers. 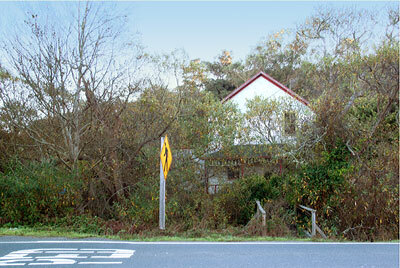 The town's calaboose was located nearby. Some of the buildings of the red-light area lasted until after World War II, but only this one remains today. The building meets the registration requirements for its property type."